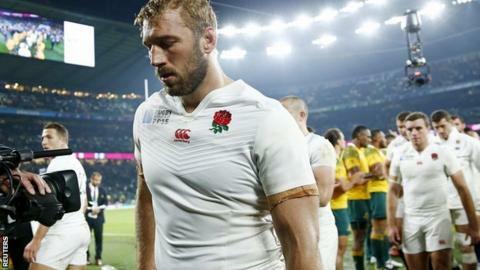 Eddie Jones intends to meet Chris Robshaw early in his tenure as England head coach after criticising the captain during the World Cup. Jones had said Robshaw was not "outstandingly good in any area". The Australian became England's first foreign coach on Friday, replacing Stuart Lancaster on a four-year deal. "Chris has got a nice cafe in Winchester. Fantastic coffee. Best coffee in England. I might grab him for a coffee down there," said Jones. The right man for England or just someone different? England endured a miserable World Cup campaign, becoming the first host nation to go out of the competition at the group stage, before Lancaster left his job after nearly four years in charge. Harlequins flanker Robshaw was appointed England captain by Lancaster in 2012 and has 43 international caps. Jones, who led Japan at the World Cup, wants his skipper to be in the mould of newly retired New Zealand great Richie McCaw, who lifted the Webb Ellis trophy in his final professional game. "Leadership is something you have to develop," said Jones. "The first thing with a captain is that he has to be one of the first players selected. "You've got to know the guy is going to be in the team. Secondly, whatever values we've got in the team such as hard work, they've got to live those values. "Those stories about Richie McCaw are true. In training they go from one drill to the next and he sprints there, he's the first there. He cleans the changing room after the game and that's the sort of guy you want. "But it's not just one guy, you need a group of players around him to support him. I am sure those players are in England, we just have to find them." "Eddie Jones is going to bring something different to this set-up. He does have international experience and he does know how to win. He does have an edge about him, a little bit like Clive Woodward actually. "I love the way that Eddie Jones has said 'we are not going to copy other teams like the All Blacks, we are going to be aspire to be like England'. "Chris Robshaw won't be number seven for Eddie Jones. He might have a chance at six. England will have to have real scavengers at the breakdown if they want to compete at international level, and Chris Robshaw doesn't sit in that area for Eddie Jones. "One thing that hasn't been widely mentioned: Jones has one heck of a battle that I don't think he understands - club versus country." The right man - or just someone different? Read more on Eddie Jones - the right man for England or just someone different?